PASSENGER WILL PLAY AT LONDON’S GREENWICH AND DOCKLANDS FESTIVAL 26 - 29 JUNE 2019 with shows each day at 2pm, 7.30pm and 9pm. PASSENGER PREMIERED IN MARCH 2017, PRESENTED BY THE ARTS CENTRE MELBOURNE AND FOOTSCRAY ARTS CENTRE. This project has been assisted by the Australian Government through the Australia Council for the Arts, its funding and advisory body as well as by the City of Melbourne. Passenger received commissioning support from the Arts Centre Melbourne. Passenger is a theatre work, which places its audience inside a moving suburban bus. A conversation is heard between two fellow passengers and—as we gaze at the passing world outside—we are seduced into an altered understanding of the environment around us. 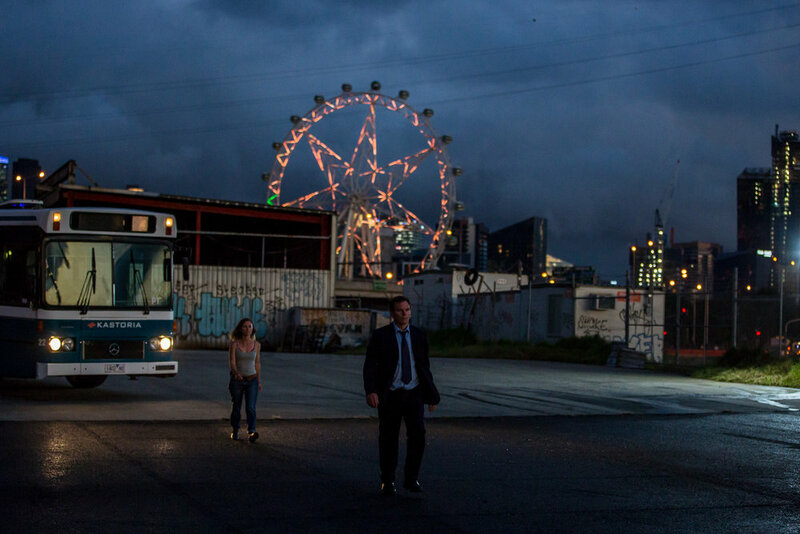 Exploring our relationship to screen media and how it influences our interpretation of the world, Passenger framed Melbourne’s Docklands as a filmic landscape. It is the frontier of a market-driven economy – and the perfect setting for a modern-day Western. Passenger references Western films where the cowboy seeks to ‘right’ a 'wrong' that the law cannot rectify. In a familiar conversational style, two strangers discuss the ethics of contemporary life before the female reveals her true identity and her seeking of retribution. The audience, engaged in a heightened 'searching' in the outside landscape as it passes by, are suddenly surrounded by a full filmic experience framed by the windows of the bus and an epic original soundtrack. This is an intriguing theatrical experience which leaves its audience tingling and alert. Up to 40 passengers journey on a suburban bus for each 1 hour experience which picks them up and leaves them at the same location. Passenger is able to be mounted in any city location and particularly suits financial-like districts. You can find TECH SPECS and further INFORMATION here.